If you’re growing water hungry plants in containers then Gro-Wool is a good idea. Gro-Wool can support house plants while watering just once every 2 to 4 weeks. When growing in clay pellets mix in Gro-Wool to make water and nutrient distribution more uniform and have a moisture buffer in case the pump fails. 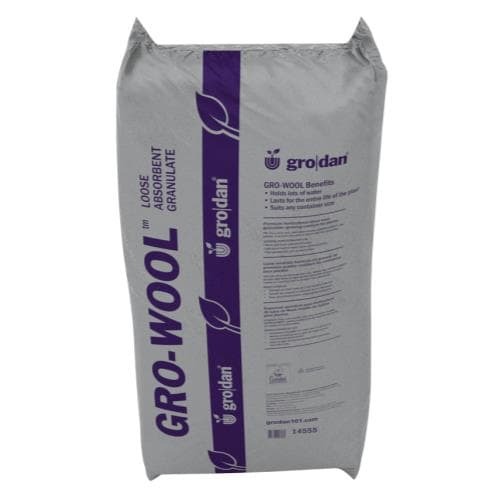 Gro-Wool also promotes fine root growth which leads to larger more vigorous growth. TIP: If you are using a drain-to-waste system, then you do not need to pH condition the Gro-wool. Just fully saturate the wool with a pH 5.5 nutrient solution. On its own as a potting mix. Mix with any potting mix to improve aeration and water holding capacity. Mix water Gro-Wool into your sandy garden soil to improve water holding capacity.